Manchester is a city with a profound musical lineage. From the Hacienda to Factory Records, it's difficult to understate the role the city – and its culture – played in shaping the post-punk that came out of its sprawling underground in the late 70s. Today, its heritage is in safe hands, as Manc three-piece LIINES pick up the torch to combine the sounds of British post-punk and Olympia riot grrrl in their infectious, riff-heavy songs. We catch up with the band's vocalist Zoe McVeigh to find out more about the band, their journey and what they've got lined up for the future. Can you introduce yourselves – where are you from, who does what and what are your roles in the band? "Hello! 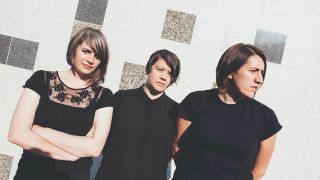 We are LIINES, a three piece from Manchester. I’m Zoe and I sing and play guitar, and also in the band are Tamsin who plays bass and Leila who plays drums." How did you guys meet and start making music together? "The original line-up was in fact another band in the years prior to LIINES starting in 2014. Steph (our original bassist) and I went to primary school together – so we go waaaay back – and Leila joined us in about 2010. Once we’d started to write new music over those following years, we could feel the sound and style start to change. This felt like something we need to mark and so we decided a name change was the way to go and that’s when LIINES was born. Since then, Steph sadly had to leave the band last year, but we invited Tamsin to join us and she’s been with us ever since – a great addition to the line-up and our live shows." What were your key influences/inspirations in getting the band together? "Big influences for us would be bands like Pixies, Nirvana and Joy Division – bands who aren’t afraid of creating space in their music and a having vulnerability in the lyrics." How would you describe your sound in three words for people who’ve never heard you? "I think we’ve been quoted as “powerful post-punk” before, which I think works." What makes you special/different to other bands out there? "I think it’s very hard to stand out these days, but maybe not trying to stand out makes you stand out more. We’ve always been a subtle band, we don’t try to be anything other than what we are – we’re not interested in gimmicks. I think that’s the key for us. We are honest and passionate about what we do and that comes across most when we are on stage. We leave nothing behind." What’s the story behind the new album Stop-Start? "We’d been talking about releasing our debut album for years before it finally happened. It’s a big job – one of the hardest but most rewarding things a band can go through. It was cool picking out the tracks we were going to record, and we feel the ten songs on Stop-Start were our core. We wanted to make sure we were putting out a set of songs that represents the early days of LIINES, with songs like Never There and Blackout, to now with songs like Shallow and Disappear. In fact, by the time the album had come out we’d already released eight of the 10 tracks as singles. So, it represents a significant period and journey for LIINES – from self-releasing singles in 2015 and 2016, to signing with indie label Reckless Yes to putting put out our debut album. Importantly for us, recording Stop-Start was something we completed with Steph (our original bassist) before she left the band, so it has an extra special meaning to us. All in all, we’re really proud of it and it’s been an exciting time to finally get it out into the world." How did you approach writing the album and how did it come together? "I write the core of our songs and they’re mostly influenced by relationships and loss, which you can hear in the lyrics, but also feel through the intensity of our music. Some of these songs have been played for years, whilst some were written more recently. But all in they are a good representation of LIINES – with a mix of sparse but full on assault songs like Shallow and Blackout, to some heavier ones like Be Here and Nothing so some slower songs like Cold and Never Wanted This. There were many challenges to recording Stop-Start – like making an album 200 miles from home (in London), which made finding chunks of times everyone could do around working full time harder, and the money needed to do that. But we got there and it was a really fun experience. We worked with Paul Tipler who has worked with loads of bands we love like Elastica, Idlewild and Stereolab. It was a great experience, and very collaborative. Instantly, hearing the first tracks back we knew he was capturing our sound in recordings like we’d never managed to before. Plus, working with a label like Reckless Yes is that they support in all the right ways, with complete creative freedom - from the music, to artwork and timing." What’s your favourite story/anecdote from recording the album? "I don’t really know there is one particular one, but more the feeling of what we were doing. The trips down to London, being a band recording for 10 hours a go for three-four days at a time and capturing the songs we’d been playing for so long… It was a really special experience that myself, Steph and Leila will always have." What, in your opinion, is the stand out track on the album? "I would say Cold. It conveys our sparse sound, energetic sound and the build at the end just blows me away each time. The production is spot on." What do you hope people will take away from the album and your music in general? "I’d hope they can hear a strong three-piece making raw, passionate and honest music. I hope they can hear our influences and note the LIINES sound throughout. The songs are written around relationships so I would love it to be some sort of go to album. My break up album for example was Rid Of Me by PJ Harvey. It would mean so much if it meant something to people or helped them through tough times like PJ Harvey’s album helped me, whether it be this or just to put on to get ready to go out." "We’ve had a few this year really. From playing some big stages in Manchester supporting the likes of Hot Snakes at Gorilla and The Membranes at the O2 Ritz, and selling out our own hometown show. But I think getting this album released and all that that represents has to be the biggest and best thing we’ve done. But, it’s where we take it next, and that’s as exciting a prospect for me." What can people expect if they come to see you live? "A band that leaves nothing behind. Every single LIINES gig is three people throwing everything into our performance. Few of our songs will reach the 2 ½ minute mark, let alone 3, but it’s a physically exhausting experience. So many people comment that they can’t believe we are just three people making that much noise! It’s not all about the noise of course, but I think coming off stage with nothing left is a great feeling as more often than not the crowd can see and feel that and they’re with you all the way." What are you most looking forward to about the future – what’s coming next? "We want to take this album to as many places as we can! Starting with our belated album launch party at The Deaf Institute in Manchester on Saturday July 21 – our biggest headline gig to date. We have some cool gig and festival dates coming up in the summer as well as autumn, plus hopes of a European tour. We’ve got a load more new songs which we’re working through for our upcoming live shows too which is really exciting to be marking the next phase for LIINES. So we will also will be planning in new releases in the not too distant future."